Halo: Glasslands is the first novel in the Kilo-Five Trilogy by Karen Traviss. It was released on October 25, 2011 on hardcover, paperback and audiobook. A sequel, Halo: The Thursday War, was released on October 2, 2012. 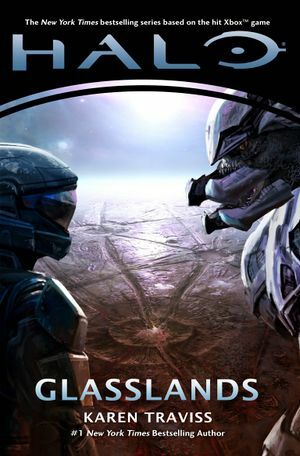 Set after the end of the Human-Covenant War in 2553, Halo: Glasslands explores the volatile political situation in the Halo universe following the end of the war. The novel picks up directly where Halo: Ghosts of Onyx left off, with Dr. Halsey, Chief Mendez along with a group of SPARTAN-IIs and SPARTAN-IIIs stranded on a Forerunner shield world locked in a slipspace bubble in the remnants of the artificial planet Onyx. Meanwhile, Office of Naval Intelligence Director Admiral Margaret Parangosky assembles a black ops team known as Kilo-Five, which is assigned on a covert mission to sow discord between disparate Sangheili factions by any means necessary, as well as to arrest Dr. Halsey once she has been located. Throughout the story, the moral implications of the SPARTAN-II program and those involved with it - particularly Dr. Catherine Halsey - are explored. In addition, the societal and religious impact the sundering of the Covenant had on Sangheili culture is explored in detail. Threads of the story also have connections to Halo 4. "The galaxy is in chaos. The aftermath of a star-spanning war has left everything in doubt - and the ruins of two once-mighty civilizations teetering on the brink of collapse. From this chaos, new adversaries will emerge, including a cruel and dangerous organization bent on exploiting the still-fresh passions and prejudices of the war for its own gain (and that's just on the human side). The Covenant-that-was, a seething mixture of religious zealotry and rival alien species, is trying to regain its primacy and find a new path back to its former glory." "Secrets and tragedies from humanity's distant and recent past will return to haunt us, and familiar heroes will be lost and found. And out of the chaos could come a new hope for mankind: a weapon unlike anything the galaxy has ever seen... but only if Dr. Catherine Halsey and the secrets she vanished with still survive and can be brought back home." The prologue begins with a narration from Catherine Halsey regarding the current situation within the core of Onyx. Continuing from where they left off, Catherine Halsey, Chief Mendez, and the surviving Spartans continue to traverse the shield world as they search for a food source, a way to revive Team Katana and a means of escape. With a sense of regret Dr. Halsey begins to wonder about her mission to save the SPARTAN-IIs and the whereabouts of John-117, Cortana, and Miranda Keyes. The story begins months later on the former human colony New Llanelli in the Brunel system. A meeting is taking place between Captain Serin Osman, accompanied by Professor Evan Phillips, and Avu Med 'Telcam, a former Sangheili Field Master, now a speaker of the Servants of Abiding Truth. 'Telcam believes that Thel 'Vadam and his followers are traitors to the Sangheili’s former religious beliefs and wants to restore their faith by killing Vadam. He requests for Osman to supply his group with weapons and a deal is reached, whereupon victory 'Telcam will leave the human race alone. Osman and Phillips then rendezvous with UNSC Battle of Minden and return to Earth. At ONI Facility Bravo-Six in Sydney, Australia, Serin Osman and Admiral Margaret Parangosky discuss the formation of Osman's new team, Kilo-Five, and its mission to neutralize the Sangheili. Parangosky also believes Dr. Halsey to be alive, but tells Osman that she only needs to divert to Onyx when anything is found. Afterwards, two ODSTs, Corporal Vasily "Vaz" Beloi and Staff Sergeant Malcolm "Mal" Geffen, arrive at Bravo-Six where they meet another ODST, Lian Devereaux and Petty Officer Naomi-010, followed by Parangosky, Serin Osman, and Professor Evan Phillips. Parangosky then discloses the mission, explaining the objective to sow discontent and strife among the Sangheili and to keep them fighting amongst themselves by arming the Sangheili dissidents. Lastly, the group is told they will be using the UNSC Port Stanley for the mission and are introduced to AI Black-Box, or “BB”. Before Port Stanley heads out, the crew is notified that the UNSC Ariadne was having technical problems. The ship requested help from the insurrectionist-controlled colony of Venezia, but the colony refused to cooperate. In Mdama on Sanghelios, Jul ‘Mdama, a former Shipmaster, heads out to Kaidon Levu 'Mdama's keep to see the Arbiter. There, Thel 'Vadam expresses his desire for unity and independence, and argues that the Great Schism led to their current situation. Jul says they should finish off the humans. However, Thel ‘Vadam believes it is foolish and plans to reach a peace agreement with humans instead. Jul continues his opposition, prompting Thel to tell the audience if they disagree they have the right to attempt to assassinate him. After Jul returns to his keep, their neighbor Relon and his brother are killed by the Servants of the Abiding Truth for demolishing a Forerunner monument. This leads Jul to contemplate the prospect of joining the Abiding Truth so he can assassinate the Arbiter. Later, Jul and fellow former shipmaster Forze travel to Ontom in order to meet with the Abiding Truth. Upon landing, they find a temple which appears to be of Forerunner origins. Jul and Forze are greeted by ‘Telcam and Jul tells him that he wants to join their cause, and ‘Telcam accepts. Soon after, they travel to the Aanrar Shipyard and steal the Unflinching Resolve, a frigate formerly captained by one of the shipmasters, Buran. Inside the Forerunner Dyson sphere, the group comes across a Forerunner tower. Mendez decides to explore the structure and gestures for Lucy-B091 to cover him. Lucy spots something moving in the shadows and decides to investigate. Suddenly, she falls through a wall and finds herself in a Forerunner hangar. Surveying the area, she accidentally attacks and kills a Huragok, only realizing her mistake too late. More Engineers then approach and Lucy puts away her weapon in a gesture of peace. She tries to communicate to them, attempting to speak but is unable to. Outside, the rest of the group splits up in order to continue reconnaissance of the rest of the shield world while Dr. Halsey and Kelly stay behind in case Lucy returns. Eventually the recon team comes across a Forerunner city. Meanwhile, one of the Huragok communicates to Lucy using a panel and introduces itself as Prone to Drift. After realizing the Huragok have access to real-time information from outside the sphere, Lucy begs for the Huragok to allow her to communicate with the outside but he refuses. Lucy then asks Prone to take her to her friends. At first Prone is reluctant, but she promises not to let them harm him. Port Stanley exits slipspace near New Llanelli and Osman arranges to meet with ‘Telcam. Kilo-Five then lands on New Llanelli and they drive a Warthog hauling a trailer full of weapons over to ‘Telcam, who surveys the crates and proceeds to take them to his ship, oblivious to the UNSC tags embedded on the weapons. As Kilo-Five prepares to leave, Mal spots and subdues a man by the name of Tom Muir, who reveals himself to be the only survivor left on the colony. Osman reluctantly agrees to take the man aboard the ship but has him quarantined. Soon after, Kilo-Five travel to Reynes in order to extract an ONI agent known as Mike Spenser. Before they can leave, a group of Kig-Yar appear and begin to move in on them, demanding their material. This leads to a firefight in which all the Kig-Yar are killed. Osman orders Mal and Vaz to bring back some of the bodies as she may have use for them. Six hours later, the corvette exits slipspace near Venezia in order to meet with destroyer Monte Cassino to transfer Spenser and Muir. They also attempt to help the Ariadne, but the patrol ship explodes before they can reach it. While conducting search and rescue for survivors near the debris field of the Ariadne, the Monte Cassino is contacted by Venezia who warns them they are encroaching on their territory, and the colony soon fires at the ship with an artillery cannon. The shot misses and Monte Cassino fires back, destroying the cannon. Port Stanley transfers Spenser and Muir to Monte Cassino, which then returns to Earth. Afterwards, Port Stanley intercepts the Jiralhanae transport Piety in order to acquire a Huragok aboard and a firefight ensues, resulting in all the Brutes being taken out. They find the Huragok and discover its name is Requires Adjustment. Osman has the dead Kig-Yar with UNSC weapons placed in the Piety with the dead Jiralhanae and sends it back towards Sangheili in order to fuel mistrust amongst the different parties. At the Bekan keep on Sanghelios, Jul and ‘Telcam await the Piety’s return. ‘Telcam explains to Jul that he lost contact with his Jiralhanae contact named Manus and that he was bringing a Huragok he recovered from Serene Certainty. The Piety finally arrives, and the Sangheili find Manus and the rest of the Jiralhanae dead, along with dead Kig-Yar clutching human rifles, and the Huragok missing. ‘Telcam checks the communication logs and finds that the Kig-Yar had radio contact with Venezia. Later, Jul suggests that they should move the Unflinching Resolve to the planet where ‘Telcam receives his weapon shipments, but ‘Telcam refuses to reveal its name or location. Jul requests to accompany him but ‘Telcam insists that he can bring no one else. ‘Telcam heads out for another shipment but Jul follows him to New Llanelli, where he discovers that ‘Telcam is receiving weapons from humans. Suddenly Jul is ambushed and captured by Naomi. While everyone is continuing their search for Lucy, she finally emerges with Prone to Drift. Using Halsey's data pad to communicate with the group, Prone asks about the situation on the outside, the status of the Flood, and shows them the Forerunner hangar that Lucy previously fell in. The Huragok also tells them that Team Katana were placed in slipspace pods because they were too damaged for them to repair. He also reveals that the shield world’s time is moving slower than normal space and that there are sensors that can view normal space events. Mendez requests to signal their ships but Prone states they must remain concealed until a presence near them is identified as not being a threat. As Prone insists on maintaining silence, Halsey grows frustrated and threatens the Huragok with her sidearm, prompting Lucy into punching Halsey and forcing her to the ground, simultaneously overcoming her post-traumatic vocal disarticulation as she repeatedly screams out “No!” Mendez then restrains Lucy and calms her down while the Spartan-IIs help Dr. Halsey to her feet. Mendez and Halsey begin to argue over the situation but Fred steps in to break up the fight. Afterwards, Prone comes back and grants them access to the control panel. Dr. Halsey speaks into the comms several times and eventually Admiral Parangosky responds. Meanwhile on Port Stanley, Osman checks on their Sangheili prisoner, contemplating whether or not to tell ‘Telcam. Requires Adjustment extracts data from Jul's body armor, and Phillips notifies Osman of the Sangheili’s name, whereabouts, and discovers he is known by ‘Telcam. Phillips begins interrogating a defiant Jul and threatens him with shame if he doesn’t give up information but Jul still refuses to give in. Osman then notifies the crew that Fleet Admiral Terrence Hood is traveling to Vadam to talk to the Arbiter and they will accompany him. Afterwards, they will head for Onyx to arrest Dr. Halsey. Later, Kilo-Five meet Admiral Hood aboard UNSC Iceni and they travel to Vadam on Sanghelios. Hood and the Arbiter discuss peace and the problems they must deal with. The Arbiter then takes interest in Phillips and tells him that he can return for a tour of Sanghelios if their ceasefire holds. Hood then invites the Arbiter to a ceremony to those who died in the war and Thel accepts. Back in the Dyson sphere, Dr. Halsey and Parangosky converse about the situation within and outside the sphere and Dr. Halsey tells her that Forerunner technology is available to them. Then Parangosky informs Halsey of the bad news; Master Chief and Cortana are MIA and that her daughter was killed. Afterwards, Prone and the other Huragok create three more Engineers to assist Halsey with the Forerunner artifacts as he and the others must stay behind in the sphere. Prone then agrees to transition the shield world into normal space. Mendez makes a request to Parangosky to designate the shield world “Ambrose” but Dr. Halsey insists on calling it “Trevelyan” in honor of Kurt’s real surname. Moments later, the UNSC Port Stanley and Glamorgan as well as two auxiliary ships, the Belleisle and Dunedin, rendezvous in the vicinity of the slipspace anomaly. The shield world expands into normal space and Kilo-Five enter the sphere. Inside, Osman immediately places Halsey under arrest. As they return to Port Stanley, Osman tells the Spartans that they will be headed back to Sydney for a debriefing, while Halsey will be transferred to Compton-Hall when it arrives. Shortly after, Jul is removed from the ship and transported to the shield world, now designated ONI Research Facility Trevelyan, where he is greeted by Dr. Magnusson. Back aboard Port Stanley, Naomi asks Vaz to look over her records as she doesn’t have the courage. Vaz checks her records and discovers that her mother committed suicide after her clone died and that her father believed the clone wasn’t his daughter. Out of hatred, Vaz approaches Dr. Halsey’s compartment in an attempt to kill her but BB convinces him to walk away. Days later, Kilo-Five is attending the Voi Memorial. Parangosky and Osman have a brief discussion about Phillips being inserted into Sanghelios and Parangosky informs Osman that she has sent Spenser to spy on Venezia. She then tells Osman that she will be appointed rear admiral and her successor next month. Later, in accordance with Parangosky’s instructions, BB presents a project called Infinity to Osman. Meanwhile, Phillips arrives in Vadam and is eventually greeted by the Arbiter. Phillips requests for a tour of their most ancient cities and Thel approves. Upon departure, Phillips notices parts of the land have been glassed and is told there was fighting amongst the Sangheili. Catherine Halsey, now detained aboard the station Ivanoff, is being interrogated by Parangosky. First Parangosky tells her that she is confirmed dead to the rest of the UNSC until Parangosky states otherwise. She then accuses Halsey of lying to her about the clones used in the Spartan program and they have a heated argument about the issue. Parangosky also tells Halsey that she has her journal and that she is heading a new Spartan program. Before leaving, she hands Halsey a picture of a plaque with her name and epitaph on it. Port Stanley travels to Venezia, whereupon Mal and Vaz land on the surface, put on disguises and meet up with Spenser. Once in Spenser's hideout in the city of New Tyne, the ONI agent shows them pictures of all the insurrectionist leaders based on the planet. Vaz looks through the pictures and one of them turns out to be Naomi’s father. Meanwhile in Ontom, a crowd of Sangheili gather around Phillips, amazed that he can speak their language and unlock their arum puzzles. As Phillips unlocks another arum, it turns out to contain a warning from the Abiding Truth. Suddenly, ‘Telcam approaches Phillips and takes him to the entrance of his temple. ‘Telcam warns him and asks him about Jul ‘Mdama, but Phillips says he does not know him. Suddenly, two explosions go off near them and Phillips' cam feed is lost. Osman immediately orders Devereaux to retrieve the rest of the squad from Venezia and prepares the ship for a slipspace jump back to Sanghelios. The novel introduces the titular "glasslands" as an in-universe term for human colony worlds glassed during the war. The cover of the novel was illustrated by former Bungie concept artist Eddie Smith. Halo: Glasslands features Easter eggs that reference Red vs. Blue, as Karen Traviss is an avid fan of the machinima series. These include Black-Box saying "Yoink", one of the ODSTs commenting on thinking a Sangheili said "Blarg. ", and a Sangheili mispronouncing the name "Phillips" as "Phyllis", which is the phonetic pronunciation of the AI F.I.L.S.S from Red vs. Blue. An excerpt of the novel's first chapter was released in the September 2011 issue of Official Xbox Magazine. The excerpt was then republished on Tor's official website. An excerpt of the novel's second chapter was released on October 12's Halo Bulletin on Halo Waypoint. ↑ halo.bungie.org: Re: Might be my favorite cover.